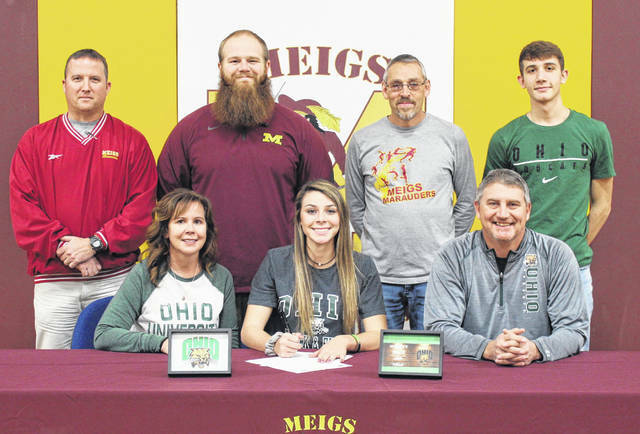 On Wednesday at Meigs High School, senior Kassidy Betzing signed her National Letter of Intent to join the Ohio University women’s track and field team. Sitting in the front row, from left, are Kim Betzing, Kassidy Betzing and Cary Betzing. Standing in the back row are Meigs athletic director Kevin Musser, MHS assistant track coach Tyler Brothers, MHS track coach Mike Kennedy, and Cole Betzing. ROCKSPRINGS, Ohio — Just a hop, skip and a jump away… and for her, maybe less than that. On Wednesday inside Meigs High School’s Larry R. Morrison Gymnasium, the school’s most decorated track and field athlete of all-time, Kassidy Betzing, signed her National Letter of Intent to join the Ohio University women’s track and field team. Betzing — who has competed at the OHSAA Division II State Championships in all-3 seasons, with her senior campaign still to come — enjoyed the recruiting process and is grateful for the opportunity she’s receiving from OU coach Clay Calkins, as well as all the other college coaches who have reached out. A three-time competitor in the state long jump, Betzing was seventh as a freshman with a leap of 17 feet, 2¾ inches. She was runner-up with a distance of 18 feet, 9½ inches as sophomore, while placing fourth as a junior with a leap of 17 feet, 6¼ inches. Kassidy was also part of the Lady Marauders’ 2017 4x100m relay team that finished eighth in the state. MHS track and field head coach Mike Kennedy was happy for Betzing, and noted that she serves as an example that hard work pays off. 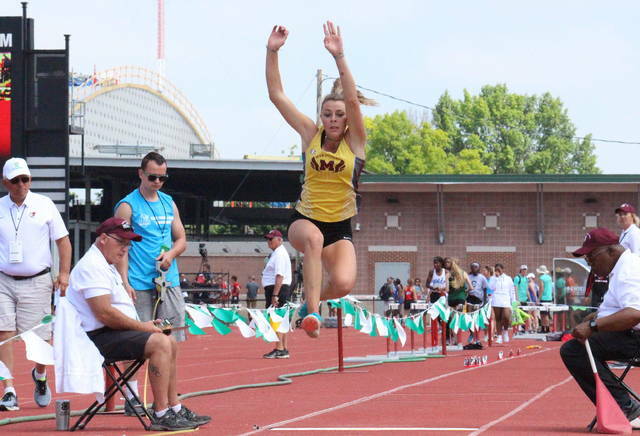 Kassidy has won the long jump at the Tri-Valley Conference Ohio Division championship in all-3 chances, and currently holds the league record in the event at 17 feet, 7½ inches, set last spring. Betzing — who is currently undecided on a major, leaning toward physical therapy or audiology — talked about why Ohio was the right choice for her and what kind of goals she has when she joins the Bobcats. “The first time I visited, it defiantly felt like home,” Betzing said. “It’s always been so close to home. Whenever my parents want to come see me I’m not too far away, but I am far enough to where I’ll be separated. Kassidy is also a three-time district champion in the long jump, setting the district meet record of 18 feet, 7 inches as a sophomore. In the long jump at the Region 7 championships, Betzing has a pair of runner-up finishes to go with a gold medal as a sophomore. Betzing — who holds a 3.9 grade point average, currently placing her 11th in the Class of 2019 — has also been an All-Ohio honorable mention on the basketball court, and a first-team all-district volleyball player.